Yooralla Business Enterprises are competitive and sustainable businesses that provide a range of co-packing and light manufacturing services for a broad range of food and industrial products. They also operate garden and property maintenance crews ready to serve their local community. With four Business Enterprise sites across Victoria—Metro Melbourne, Shepparton/Mooroopna and the Hume Region—our factories are equipped with packing lines, material handling equipment and on-site warehouse facilities. Our regional factories specialise in manufacturing timber products, box packaging and screen-printing. Our business enterprises currently employ up to 200 people in both full and part-time positions, providing training, personal development and social interaction. Are you seeking rewarding and meaningful work? Would you like to gain new skills? Would you like to get work experience to one day transition into open employment? If you would like to learn more about working in one of our Business Enterprises, we would like to hear from you. 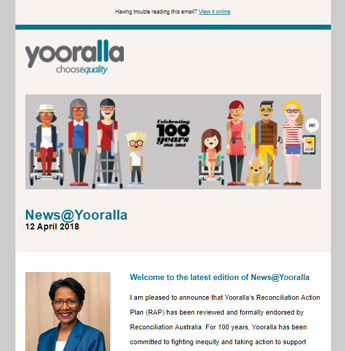 Yooralla are proud to support employment through our Business Enterprises, which provide opportunities for you to engage in meaningful work, earn a wage, and prosper from satisfying and rewarding employment. You can view and apply for current vacancies online. Or you can contact us on the details below to start a conversation about the kind of work you want to do, your abilities, interests and support needs. Yooralla Business Enterprises offer a range of packaging and assembly services for food and industrial products. Book your next job with us and you’ll get a quality job at great prices, and you’ll be helping to provide employment opportunities for people with disability. Find out more about our packing and assembly services.